As US Highway 82 runs through Greenville, Mississippi, the speed limit drops from 65 mph to 35 mph with a series of traffic lights. The traffic that flowed smoothly through the countryside bunches up and crawls in fits through the city of Greenville. I was halfway through town, heading west toward the nearby Mississippi River, when I stopped for a traffic light. There was nothing extraordinary about the stop. As I approached the intersection, the light changed from green to yellow, followed by red. I began braking the moment it changed to yellow, and the light was red well before I reached the intersection to stop behind the white line painted across the asphalt highway. The logging truck behind me was less responsive. A glance in the rearview mirror showed him bearing down on me while vigorously plying both brake and horn. I punched the gas to jump across the spacious cross-walk and stop halfway into the cross-lane, leaving just enough room for cross-traffic to squeeze by. The trucker took full advantage of the extra stopping footage, grinding to a halt a couple of feet behind my bumper. Too close for comfort, but no harm done! I relaxed into my seat, thankful a collision had been avoided. “F*** the light!” he screamed, stalking back to his truck. As the light changed to green, I pulled ahead of the heavy truck. A few blocks further, I stopped at another red light. Glancing in my mirror, I saw the road-rage driver two blocks back in the left lane, abreast another logging truck in the right lane. Both trucks barreled straight through a red light to stop where I was…one to my left and one behind me. Both loudly revved their engines awaiting the light change. That seemed like a pretty aggressive move, intended to intimidate. I wasn’t really scared, but I was concerned. Accelerating through the green light, I reached beneath the car seat and retrieved my hand gun. Placing it on the seat beside me, I breathed a prayer for protection and wisdom. I wasn’t really expecting an altercation, but wanted to be prepared just in case. As we neared the edge of town, the car in front of me turned right, and I saw a police officer signaling me to do the same. Something struck me as odd. Traffic was rolling on down the highway, ahead. There were no detour signs or flashing lights. No police cars were in view. Yet this police officer was looking straight at me, clearly signaling me to turn right, off the four-lane highway, onto a narrow residential street. I made the right turn, thinking there must be a crew ahead cleaning broken glass off the highway. I glanced in my mirror expecting to see a line of traffic following, with the two logging trucks on my bumper. Instead, I saw the police officer standing in the middle of the road, facing away from me as he watched the highway traffic roll by. Nobody else was diverted. So I kept going straight. Three blocks further on, the road teed into another street at a stop sign. I had to turn either left or right. I looked around. No more police officers to direct me. Still no detour signs. The car in front of me had turned right, but he appeared to be headed toward a specific destination within the residential neighborhood. Right would take me back east…opposite my direction of travel. I turned left. Within a couple of blocks, I intersected a four-lane street at an oblique angle. This could be US-82 if it had curved right. Or it could be another street altogether. The street sign read Grand Avenue…not much help as I was watching highway numbers not street names. Left would take me back almost to the point I was diverted, so I turned right. Within five minutes a sign informed me I was traveling north on State Highway 1. Knowing the next Mississippi River bridge was miles out of my way, I turned around to head back south toward US-82. As I approached US-82, I glanced left. There was the street I’d been diverted onto, just a couple of blocks back. There was no police officer in sight. No signs, no flashing lights, no accident, no broken glass…just normal traffic flow. I turned right and headed for the river as I pondered the strange occurrence. By the time I was crossing the river, I was starting to feel a little peeved. Why did those officers divert me? They wasted a good fifteen minutes of my time, for no good reason! About the time I entered Arkansas on the other side of the bridge it occurred to me that those two logging trucks were now fifteen minutes ahead of me…with no idea I was still traveling the same direction. Now, I’m pretty quick to see miracles in everyday events such as a pretty sunset or a baby’s laugh. I’m also fairly quick to give God credit for miraculous timing of events…things that come together with too much precision to be reasonably counted as random coincidence. I am not, however, overly quick to call things supernatural if they can be reasonably explained as natural events. 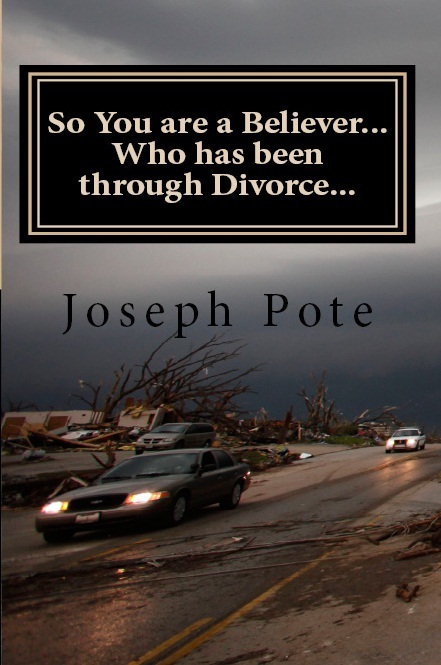 I give God full credit for both natural events and supernatural events. However, I don’t generally feel the need to label something as supernatural when it could be divine timing of natural events. This one has me puzzled, though. It really would not be reasonable to assume two police officers just decided to coordinate together to play a prank on a random stranger. It would be even less reasonable to assume they decided to single out one random vehicle out of a highway full of vehicles as the subject of a joke. And it becomes even less credible to assume they would decide to play the joke without using any flashing lights or police cars. Logic drives me to the conclusion that I was intentionally singled out to be diverted for a specific purpose. The most obvious purpose would be to separate me from the pair of road-rage truck drivers. However, to accept this means I must also accept this was a divinely inspired plan for my protection…and that those were no ordinary police officers. In the Bible, angels served two primary roles, as guardians and as messengers. Whether natural or supernatural, those two police officers acted as guardians and messengers on my behalf. They were my angels. Which means, I am greatly loved and under divine care. 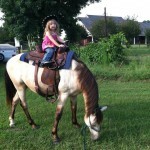 The last few weeks, I’ve been working with our five-year-old gelding to relax, slow down, and smooth gait transitions. Knockout is a sweet-natured young horse with good confirmation and an excellent pedigree. However, he tends to be tense during rides which can lead to issues. Last weekend, following a stormy Friday night, our arena was too muddy for riding. 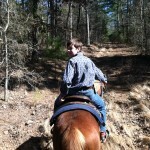 So I decided to take Knockout on a trail ride through our back pasture and woods. In general, Knockout tends to be skittish with woodland trails and water crossings. I assume his west Texas raising didn’t provide much opportunity for either. Saturday morning we started out. The 8-inch rainstorm left creeks swollen and trees dripping. Needless to say, Knockout had ample opportunity to feel stressed…and I had ample opportunity to ask him to relax. Knockout tends to respond the same to each stressful obstacle, whether a fast-flowing creek, a low-hanging branch, or a tall vine. First, he balks. He looks for an out…an alternate path. He may try to turn aside, or he may try to turn around. At this stage, his goal is to simply avoid the stressful situation. As I continue to hold him to the course and nudge him forward, Knockout’s next strategy is to bolt. Basically, he concludes that if the obstacle cannot be avoided, then the next best thing is to get past it as quickly as possible. Initially, I allow some level of controlled bolting. While I won’t allow him to totally flee the scene, I don’t mind him picking up to a trot past a ‘spook’ then dropping back to a walk. Over time, however, I expect him to take these things in stride without the need to change speed. Since he was particularly nervous this morning, I decided it was a good time to work past some of his fears. I picked out one short stretch of trail that he was especially stressed about and looped back over it, working on relaxing and walking calmly. After several cycles, he was calmer, but still had specific trail sections he tried to rush past. So, I began stopping and backing him up each time he broke into a trot. I backed him up to the location he spooked, and dropped the reins. When he tried to step away, I interfered then dropped the reins. The first time I brought him to a full stop beside a ‘spook’ Knockout responded with an attempted buck. It wasn’t anything malicious, just a natural response to the situation. He was nervous and frustrated, seeking release for pent-up energy, and it came out in a buck. Fortunately, I was ready and caught it quickly. I interrupted the buck then dropped the reins. Once Knockout relaxed in the full-stop and ceased trying to buck or step away, I prompted him to continue down the path. Before long, he learned what I wanted and relaxed quicker. By the time we’d circled through the same path about twenty times, Knockout was able to calmly walk the full path. I could literally feel him relax and cease resisting. We continued a very relaxed ride back home and ended on a good note. As I thought about Knockout’s lesson that day, I realized he saw three possible responses to a tense situation. As he saw it, he could either balk, bolt, or buck…and if the first didn’t work he’d try the next. My task is to teach him another option…to believe…to simply relax and trust me. That’s not an easy thing. When his fight-or-flight instincts tell him to balk, bolt, or buck, it’s not easy to trust me enough to simply relax. How often does the Holy Spirit whisper, “Fear not. Peace, be still. Have faith. Trust in Me,“ as I frantically look for an out or throw a fit? And how many times do we circle back around to repeat a lesson I haven’t yet internalized? Lord, please continue to be patient with me. Help me learn to face stressful situations, not with fear, but with confidence in you. The morning of Wednesday, March 2, I completed my final radiation treatment. What a relief! Although I know I still have many weeks of healing before me, completing treatment means my body can finally begin to heal. That evening, I crawled into bed exhausted and hurting. Conflicting emotions swirled…thankfulness and hopefulness at knowing I am done with cancer treatments…exhaustion from battling pain and struggling to keep my fluid and nutrition intakes up…intimidation at realizing I still have a long road of recovery before me. I lay there thinking about the healing process…knowing I need more nutrition for substantial improvements…knowing my nutritional intake cannot substantially increase until my mouth and tongue heal enough to allow a broader diet selection. Wondering how long it will take to heal…I knew it would take several days to see any improvement at all, because recent weekends failed to show any improvement. As I lay there praying, I remembered the heart-shaped prayer cloth on my night table. My mother sent it to me weeks earlier, when I first began cancer treatments. Mama asked the pastor and elders of her church to pray over the cloth, then mailed it to me. 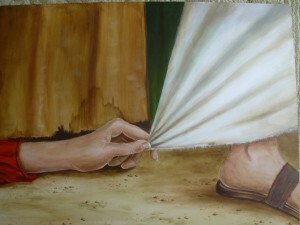 As I prayed, “Let me just touch the hem of your garment,” I realized how similar that is to a prayer cloth. In neither case is the healing power in the cloth itself, but in our Healer, Jesus Christ…yet He used cloth as a conduit for His healing power. I awoke Thursday morning, with the blisters gone from my tongue. My mouth and tongue are still very swollen and sore. But the raised blisters are gone…along with the sharp pain that accompanied them. I awoke at 3:30 this morning to a dark, quiet, peaceful house. As I lay in bed, drowsily assessing my condition, I slowly realized that for the first time in over a week I had no pain and no nausea. I was a little thirsty and knew I should sit up and drink some water…hydration is very important right now…but chose, instead, to simply lie still for another hour. Sitting, swallowing, even moving could easily lead to pain or nausea, and I wanted just another hour simply enjoying the peaceful pleasure of being free of both, no matter how temporary. So, I lay peacefully still, thankfully pain free, reflecting on how recently this was my norm. To put it in proper perspective, you have to understand how healthy I was prior to my cancer diagnosis in December. I had so few prior health issues the nurses acted skeptical of my correct completion of the various new-patient medical forms. The entry interview for my first CT-scan was typical. “We’re just trying to figure out why this lymph node is swollen,” I responded touching the swollen area on the right side of my neck. The scan showed a tumor, which led to biopsy surgery, which showed the tumor to be malignant. A second surgery followed to remove the tumor along with the lymph nodes on the right side of my neck. A couple of weeks later, we began a rigorous seven-week treatment plan of weekly chemo treatments combined with twice-daily radiation treatments. Having just completed my 3rd week of radiation and my 4th chemo treatment, I’m counting myself as half-way through. The first two weeks weren’t too bad in terms of side-effects, but this last week has been a lot tougher. Some days are harder than others. I keep reminding myself that I’m half done…and I keep counting my many blessings…while praying for strength and wisdom. Remember, prior to my diagnosis I felt great! I was active, energetic, and pain free. I had an excellent immune system and was rarely ill, even when the rest of my family came down with whatever bug was circulating. Other than the apparently-minor-issue of a swollen lymph node, I was the very picture of good health! And remember, I have never personally seen or felt the cancer. Relying solely on the word of medical professionals and the results of medical tests and scans…the evidence of things not seen…I submitted to surgery. And remember, the cancer was surgically removed. The surgeon reported successfully removing all visible signs of cancer. The post-surgery CT-scan showed no abnormalities. However, the biopsy showed this to be a very aggressive cancer, likely to return unless all microscopic traces are eradicated through further treatment. And this particular cancer is known to be very responsive to the combination of radiation and chemo treatment. Medically, my prognosis is excellent…the substance of things hoped for…if I complete the prescribed treatment plan. Then I click back through the data…the research results…the accumulated histories of patients fighting the exact same cancer I’m fighting…and I know the right decision is to keep going until it’s done. That requires a lot of faith! …faith that my doctors have a correct diagnosis…faith in the medical technology…faith in the medical research…faith in medical knowledge and wisdom. It’s easy to intellectually accept these things based on scientific evidence. It is much harder to act on that accepted knowledge when the action carries a very burdensome path of lengthy treatment. It’s still all substance of things hoped for based on evidence of things not seen. My only knowledge of the cancer is my doctors’ word. I am relying completely on the medical community for both the diagnosis and the best treatment plan. That requires a lot of faith in the medical community! If I can have that much faith in the medical community, how much more faith can I have in my Heavenly Father? How much more faith can I have in the God of Abraham, Isaac and Jacob, who continually displays His faithfulness and lovingkindess? How much more faith can I have in Jesus Christ, my Savior, Redeemer, and Deliverer, who, for our sake, submitted Himself to be tortured, crucified, and killed? How much more faith can I have in the Holy Spirit, our Comforter, sent by Christ Himself, to comfort, teach, instruct, and bestow wisdom? I have called thee by my name; thou art mine. When thou passest through the waters, I will be with thee. When thou passest through the rivers, they shall not overflow thee. When thou passest through the fires, thou shall not be burned. He leadeth me in the paths of righteousness for His namesake. For thou art with me. Thou preparest a table before me, in the presence of my enemies. 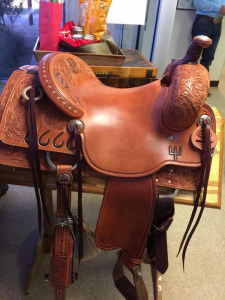 When I married my Rodeo Queen, I understood horses and tack were part of the deal. However, I had no idea as to the magnitude of cultural and language barriers to be overcome for effective communication. On Monday, December 14, 2015, my doctor informed me the CT-scan of my neck showed a tumor-like mass. Appointments were scheduled for PET-scan and biopsy surgery later that week. We did not yet know whether the tumor was malignant, but my medical team was working under the assumption that it likely was. In the course of one afternoon, Sherri and I were required to adjust our thinking from expecting my swollen lymph node to be a minor concern to realizing it was a huge concern. It was a lot to try to wrap our minds around and emotions swirled. We weren’t sure, yet, exactly what we were facing or how timing would play out, but we began to let employers know our work schedules would need to be flexible for a while. “Okay, I’ll look at it. What’s the name of the clinic?” I assumed we were talking about a clinic within reasonable driving distance, such as UAMS in Little Rock or MD Anderson in Houston, but wondered if she was thinking something further away like Mayo Clinic. What? I wasn’t sure exactly what a two-day healing clinic was…nor why Sherri was looking into it. Sherri is very level-headed…not prone to rushing to try the latest health fad. She also tends to have a healthy dose of skepticism toward spiritual things requiring more open-mindedness than her Baptist raising. Of the two of us, I am the one more open to natural remedies and miraculous intervention. Although I knew Sherri was upset about my impending diagnosis, this was totally unexpected. And a two-day clinic? What was supposed to happen in two days? Was this two days of Pentecostal-style name-it-and-claim-it preaching with a five-step plan to claiming your healing in two days or less? Or was it two days of charismatic info-mercial-style lectures proclaiming benefits of expensive herbs with an abundance of anecdotal testimonials combined with limited scientific study? Either way, I was skeptical. We both laughed out loud! Some much needed levity in the midst of a confusing situation. I’m not sure what that means. People say some crazy things coming out of anesthesia, and maybe this was just my own craziness coming out. Or maybe it was my subconscious giving voice to some deep seated desire. Or maybe it was a subconscious recollection of the prior conversation with Sherri and the word play on healing and heeling. Or maybe it was God, Himself, taking advantage of the quiet of anesthesia to get my attention. But, as I’ve had time to think about it, the idea appeals to me. I know I’ll never be competitive, but it would be pretty cool to learn to rope…and finding another activity to enjoy with an adolescent child is always a good thing. Right now, I’m still recuperating from surgery and my right arm lacks the strength to twirl and throw a rope. But maybe that’s exactly what I’ll need for physical therapy a few weeks from now. Maybe I’ll find healing in heeling! A couple of weeks ago, we visited the Four-Sixes Ranch in west Texas, for the Return to the Remuda Sale. What an amazing weekend! 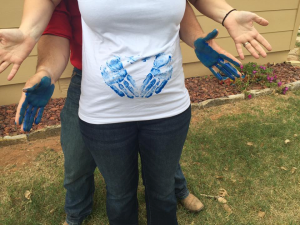 We visited with family and friends, met some famous horsemen, toured a well-managed ranch, watched some beautiful horses, and even acted as photographers for an expectant cousin’s baby gender reveal. Then, to top it all off, we purchased a really nice horse…and won a really nice saddle! In making plans for the sale, Sherri and I discussed spending budgets, reviewed the sales descriptions of each horse, and discussed what we were looking for. However, I did not really expect to buy a horse. I had been to the same sale a couple of years ago and already knew the bidding was way outside our range. With few exceptions, the bidding was way outside our range this year too. 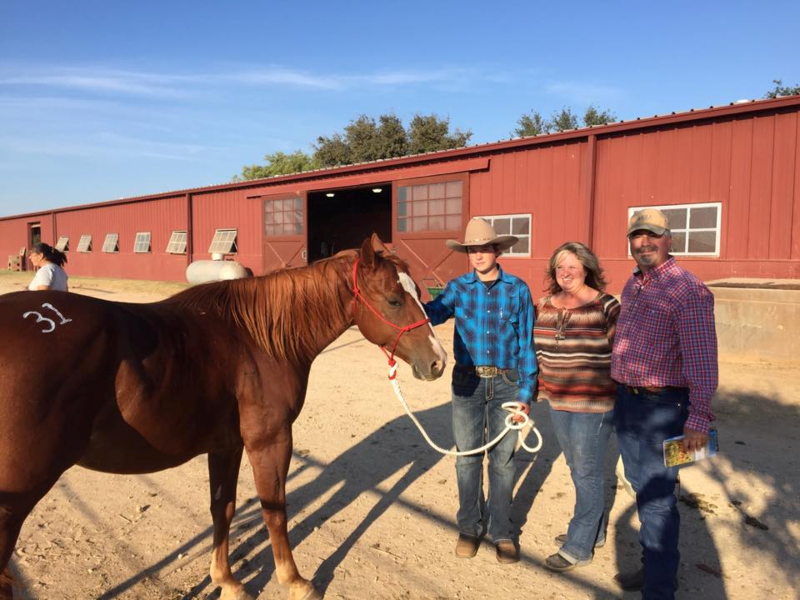 We were looking for a well-bred gelding with ranch work and roping experience. 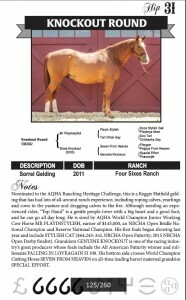 The experienced geldings 7 to 15 years of age were bringing top dollar. 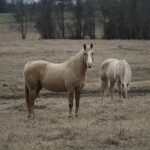 The participating ranches are known for well-bred horses. The 6666 Ranch, in particular, has a world-renowned horse breeding program. And a well-bred horse experienced in west Texas ranch work is going to be ready for almost anything a rider would want to do in the way of ranch or rodeo riding. The bidding was also high for the young stud colts. Although the colts lack experience, they have the ability to sire more well-bred colts. Someone involved in American Quarter Horse breeding would have a hard time finding a stud colt with better pedigree credentials than these. 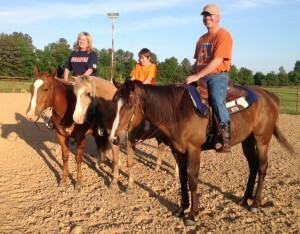 The horse we bought is a four-year-old gelding named Knockout Round. 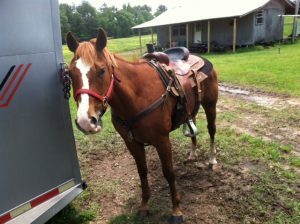 Knockout is too young to really be called experienced, and can’t breed because he’s been gelded. So the bidding was more in our dollar range. Although he needs a bit more finish work, we are very pleased with our good-natured high-pedigree Four-Sixes-bred ranch horse. Which got me thinking about the importance of lineage. 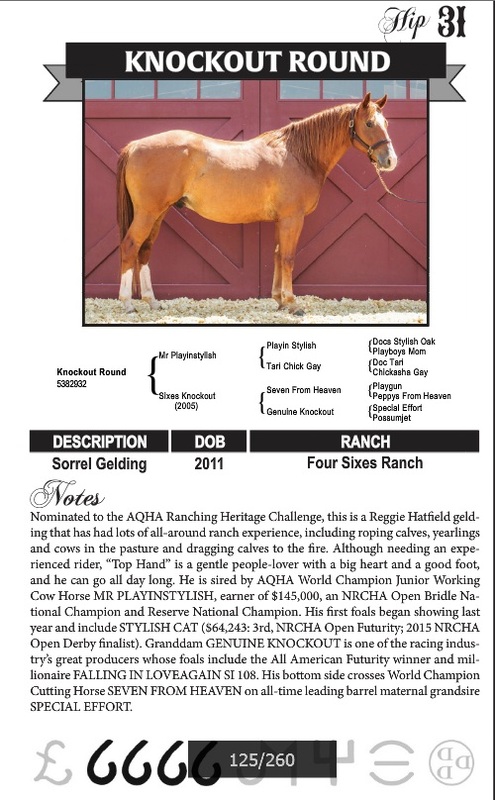 For every horse in that sale, pedigree was an important selling point. Lineage is so important that a pedigree chart was provided for every single horse in the sale. Most of these horses have a few champions in their ancestry. Although no guarantee, performance of ancestors provides some indication of potential performance of the horse. High performing horses with good confirmation, plenty of strength, speed and agility, who learn quickly, respond well to training, and instinctively understand cattle, tend to sire horses with similar traits. Lineage matters not only for horses, but also for people. According to the Bible, as descendants of Adam, we all inherit Adam’s slavery to sin and death (1 Corinthians 15:22). We inherit Adam’s natural inclination toward sin and selfishness. Sin is not just something we do. Sin is part of who we are…an inherited trait. 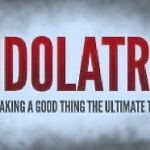 Our pedigree naturally prevents our being godly and limits us to being sinful and selfish. In fact, because of Adam’s sin, we all have a natural pedigree as children of Satan with a natural inclination to lie and murder as Satan does (Genesis 3:15, John 8:44). We understand the importance of pedigree, and we know pedigree cannot be changed. We can improve a horse’s nutrition. We can provide training. We can address medical concerns. There are a lot of things we can do to help a horse achieve its full potential. However, there is nothing we can do to improve the limitations imposed by poor lineage. Yet, here God tells us since the limitations of our pedigree cannot be overcome, He will give us a whole new pedigree! By receiving Christ and believing in His name, we are redeemed from that relationship with the kingdom of darkness and given a whole new lineage as children of God. We become born of God! What lineage do you choose? Child of satan, or child of God?